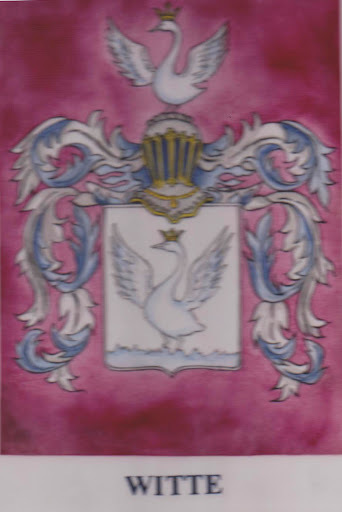 Research into the von Witte family history has revealed a connection to the Baltic German noble family of “von Schwanenberg”. Research on this connection continuous. In general, the "von" form indicated the place the family originated as well as indicated that they were currently in possession of a certain place, therefore ''von” indicated that a family was still in possession of their original feudal holding or residence. The family shield was usually a symbol of such a bolding or residence. Heraldry – is an old science - which has focused on the rules of illustrating pictures of different European coats, arms, crests, seals shields, etc. These items have always been performed with great devotion and nobody has ever questioned the usefulness of using them. Heraldry goes back to the times of crusades and wars during the Middle Ages when the conquering armies used crests and shields as part of their war equipment. Specially the decorations illustrated on the war equipment as could best be seen on the crests, coats and shields became symbols of honesty, victory, and strength. All was about conquering new territories or defending their own against intruders and spreading European culture, values as Christianity. Heraldry – as a source of European culture - has also offered interesting data for historians, facilitating considerably their work. From today’s perspective heraldry is a perfect tool to serve society. In Germany there has been a considerable production of heraldic works during a long period of time and heraldry has always been highly appreciated by the Germans. The (ättemärke) mark of family origin has been an important identification card for many families in Europe. The mark of family origin (ättemärke) referred usually to the family’s place of birth and land estates as well as their nobility. These factors were illustrated on coats, crests, shields, signets, cachets and stamps etc. This history of the mark of family origin - as a part of European historical past - is a one of the most important contribution of the heraldry to the European history and to the younger generations. Thanks to the drawing of the shield we received from our uncle Leo de Witte of Amersham, Great Britain we were finally able to trace the real heraldic shields of the “Witte von Schwanenberg”. We are also specially thankful to uncle Andre de Witte (who passed away several years ago in Paris) and to his kind friends in the noble circles of Great Britain for receiving the drawing of the shied “Witte”.